Today in Masonic History Joseph Rogers Underwood was born in 1791. Joseph Rogers Underwood was an American politician. Underwood was born on October 24th, 1791 in Goochland County, Virginia. At the age of 12 he moved to Barren County, Kentucky where he lived with an uncle. There he attended common schools. He would graduate in 1811 from Transylvania College in Lexington, Kentucky. After graduation, Underwood began studying law. His studies were interrupted by the war of 1812. He served during the war as a lieutenant in the Thirteenth Regiment of the Kentucky Infantry. After serving he returned to his studies and was admitted to the bar in 1813 and began a practice in Glasgow, Kentucky. Underwood entered the political arena by becoming a town trustee and county auditor. In 1816 he was elected to the Kentucky House of Representatives. He served until 1819. Underwood moved to Bowling Green, Kentucky in 1823. He was elected again to the Kentucky House of Representatives serving from 1825 to 1826. From 1828 to 1835 he served as a judge on the Kentucky Court of Appeals. In 1835 Underwood was elected to the United States House of Representatives. He served in the House until 1843. He declined renomination and returned to Kentucky where he again served in the Kentucky House of Representatives. During this time he was the Speaker of the House. 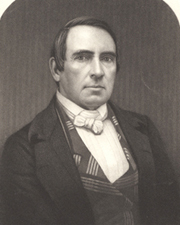 In 1847, Underwood was elected to the United States Senate. He served until 1853 when he did not seek re-election. Instead he returned once again to the Kentucky House of Representatives from 1861 to 1863. Underwood passed away on August 23rd, 1876. Underwood was a member of Allen Lodge No. 24 in Glasgow, Kentucky. After he moved to Bowling Green, Kentucky he became a member of Clay Mark Lodge No. 7. He also joined Bowling Green Chapter No. 38, Royal Arch Masons.